There is a purpose behind all our lives and sometimes it takes many years to see how the hand of God has used every past experience to bring about that purposeful end. Converted at a mere seventeen and a half, James’s quest to enter ministerial training was severely hampered through lack of basic education, exacerbated through truancy as a means of avoiding school sports in which he was hampered by deformed feet. Nevertheless, brief spells in two Bible colleges, following his conversion, would not be in vain; nor would his flitting around the competing sects as well as denominations of the late 1940s which temporarily ceased following his acceptance of a short lived Baptist pastorate in the early 50s; the cause being ‘a near to midnight’ elopement with the one to be his first wife for the next 23 years. Back at ‘square one’ and while in secular employments James momentarily affiliates himself to the Church Of The Nazarene as a preacher and this is followed by receiving a call to a small Free Methodist pastorate on a non paid basis. But this is not for long! The offer of an intensive four-year course within a Congregational seminary affiliated to the University of Nottingham opens up. Yes, and with it goes a part time student pastorate, first of one and then of two Yorkshire churches within the late 1950s and early 1960s. Following on from his first ordination James dearly wanted to be involved in animal activism but, quite cowardly, kept quiet for fear of repercussions. Anglicanism, with the security of a parson’s freehold – a privilege then enjoyed by every Incumbent and safeguarding him from those who might oppose his preaching – appealed to James. And so - after a brief yet memorable stint at an Oxford postgraduate college - James moves on from Free Church Liberalism in to Broad Church Anglicanism where, as a curate for 3 years he rocks the boat over animal cruelty before being elevated to Incumbent of an affluent rural parish prominent for its ‘love of the hunt’. A parish which, for obvious reasons, he relinquishes after 2 years. Most of the 1970s find this evolving ‘Animals Padre’ dividing his work between the chaplaincy of a new Huddersfield hospital and that of a down town anglo-catholic parish. Within the latter he commences an annual animal blessing service, as well as in taking an active role in more militant animal issues throughout the town. Indeed, teaching in a Girls High School, a sixth form college, and later a college of further education, were gentler means by which he also sought to further the message of animal rights in – what was for him! – those turbulent 1970s that culminated in the break-up of a, once, romantic, runaway marriage. Meanwhile, James was evolving to realise that ecumenically minded, contemporary British Christianity had sacrilegiously shrunk the love of God and quite unforgivably distorted the redemptive work of His Son. Each of its branches – which he now knew quite well - had shared in the same grievous sin. They had all - one might feel - conspired to exclude birds and beasts from their arrogantly assumed ‘arks of salvation’. Indeed, their prayers, their praises and their preaching were void of any concern for the ‘lower’ creation over which we are called to fulfil a caring stewardship:: a hopeful reflection of that ‘dominion’ that Christ asserts over us: the greatest becoming the servant of all! It is the belief of UKs ‘Animals Padre’ that Christendom’s present form of human chauvinism is as detestable to God as was the chauvinism of Old Testament Judaism which rejected its role as a missionary people to bring the light of God to the rest of the nations and, instead, considered itself to be the exclusive elect and all else to be reprobate and damned. Well, is not contemporary Christendom reflecting a similar grotesque distortion concerning the larger creation? Surely the spiritual arrogance of this last statement must equally imply that all the mentally retarded of humanity are likewise damned, as must be all who have never had a Bible thumper to corner and ‘button hole them’ with an ABC of biblical quotes!. 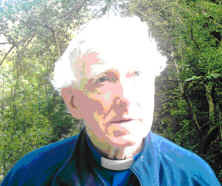 Such biased and bigoted views must truly be an offence to the Gospel of Christ because they sacrilegiously distort the supreme analogy of our Faith: that of the Good Shepherd prepared to lay down His life for members of a lesser and lower species: sheep submitted to a good shepherd’s care..
James has used each and every bitter experience in life – and there have been many! – to much advantage. As a qualified counsellor and hypnotherapist he has been blest in helping and healing many; and all because he’s been ‘through the mill’ himself. Not least, was this the case when promoted to the role in the mid 1980s of Senior hospital chaplain for the diocese of Aberdeen & Orkney. Indeed, within the Infirmary a patient and retired brigadier, having read in the press and witnessed an animal blessing service on television, remarked: “Ah, YOU are the animal padre!” Yes, he was right, and that title soon to be taken up by the media has lasted ever since. His first animal publication, compiled in Aberdeen, was that of ‘Praise For Creatures Great & Small’ - hymns fixed to well known tunes and written for animal blessing services, demos and vigils. It received top media coverage and resulted in invitations to bless animals as far away from Scotland as Germany. And then, in James’s last parish – on the idyllic Moray Firth – more time was allowed for animal activist pursuits such as the inauguration of a pet cemetery, the burial of a faithful hound and – not least – for the task of writing and self publishing. Of these ‘Cast Out Of The Ark’ became the best seller, and a revised reprint is well overdue. You may talk as much as you like about your religion, but if it does not teach you to be kind and caring to both man and beast then it is nothing but a sham. Oh, never a brute in the forest and never a snake in the grass; or ravenous bird, starvation stirred, has hunted to prey like men. For hunger and fear and passion alone drive beasts to slay. But ‘wonderful’ man, the crown of the plan, tortures and kills for play. In 1994 James Officially retired from a turbulent ministry within the church and, since then, gave himself wholeheartedly to The Cause. He has conducted retreats and conferences, protested at demos, held vigils, denounced bull fights, blest sanctuaries as far away as Assisi, Spain and Ireland and – not least – conducted funerals in remembrance of pets. Such efforts have not gone unnoticed and he has been made a patron of a whole host of complementary organizations for animal welfare and protection. Enough to say that they have ranged from the Catholic Study Circle For Animal Welfare to the local Capricorn Animal Rescue Centre near where he lives. His one wish is that he had more strength so that he could attend and take part in as many demonstrations and vigils as he once did. Following prognosis five years after retirement that he had advanced macular degeneration as well as glaucoma – a deadly joint prognosis! – James, through much of the treatment he had learnt so as to benefit others – used the same to benefit himself! Consequently, eight years later he praises God each day that he is still medically pronounced fit and able to drive a car. Regrettably, however, debilitating bouts of M.E. has resulted in him having had to curtail much of his former, further afield tasks such as addressing the crowds at Dover, in far away Germany or even in London’s Trafalgar Square. Nevertheless - and regardless of a recent hip replacement this summer (2007) – James, The Animals’ Padre, believes that great times lie ahead for the animal cause; and along with his loving wife of the past 24 years, Doreen, he hopes to play a vital role to speed it on.